Brazil Impeachment: “Coup” “Legitimized” by U.S.
She said today: “The final phase of President Dilma Rousseff’s impeachment trial begins in Brazil’s Senate today. It is widely expected that, within a few days, senators will vote to definitively remove her from office. The impeachment — labeled a coup by many Brazilians — has generated outrage and frequent protests in Brazil, including during the Olympic Games in Rio. The main charge against Rousseff — of using common accounting mechanisms of borrowing funds from public banks to pay for social programs (previously used by her predecessors without controversy) — has been dismissed by a top federal prosecutor. Meanwhile, those leading the impeachment campaign, including former lower house speaker Eduardo Cunha and the interim president Michel Temer are accused of bribery and illegal campaign contributions. 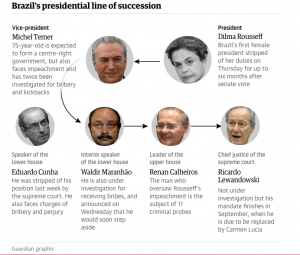 “Following the initial impeachment vote in the lower house, on April 17, an interim government was formed under rightwing vice president Michel Temer. His interim government was made up entirely of white, male ministers — in a country where the majority of citizens identify as non-white — and has been steadily implementing a conservative economic and social program fundamentally at odds with the progressive agenda that voters supported in the presidential elections of October 2014. Among other things, Temer abolished the ministries of Women, Human Rights, Racial Equality, Agricultural Development and has pledged to carry out deep funding cuts to health care and education.